View our Events Calendar 2019, we have exciting upcoming events throughout the year for your friends and family to enjoy. Why not treat someone special to a fabulous 2 or 3 Course meal in our stylish 2 AA Rosette Caprice Restaurant and then afterwards relax in our comfortable Monty's Lounge Bar with your favourite liquear. Are you planning to visit Chelsea Flower Show, the London-based most prestigious flower show in the UK? Why not stay with us and relax in our 19m indoor pool? We are only 20 minutes away from London Paddington and within 1 mile of the M4 Jct10! Show your Dad how special he is and enjoy a special 2 or 3 Course Sunday Lunch in our Caprice Restaurant or weather permitting, al fresco on our tranquil Terrace. Then afterwards have a pint of beer in Monty’s lounge bar. 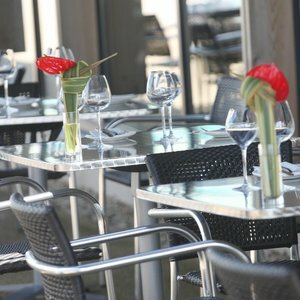 Come and enjoy the glorious sunshine and all day casual dining with our fabulous selection of light bites, quality meals, homemade desserts and refreshing cocktails. Whether you are meeting for a catch up with a friend or a quick meeting the terrace is the perfect place this summer! The superb Holiday Inn Reading M4 Jct10 in Winnersh Triangle is celebrating its highest yet Four Star Merit score after a recent unannounced overnight inspection on 8th May 2018 by the AA. Meridian Leisure Hotels is a multiple franchisee of IHG (InterContinental Hotels Group) and we pride ourselves in operating internationally branded hotels with design excellence, which makes our properties exceptional. We are passionate about maintaining the highest standards in each of our properties and constantly seek to recruit people with similar values, commitment and dedication.